Click here to see Kayford Mountain in 3-D using Google Earth. You can also watch videos, read stories, listen to interviews, and see pictures of Kayford before and after mining. Larry Gibson's family has lived on or near Kayford Mountain since the late 1700's. More than 300 relatives are buried in the cemetery on Kayford Mountain. Larry and his family used to live on the lowest lying part of the mountain, and looked "up" to the mountain peaks that surrounded them. Since 1986, the slow motion destruction of Kayford Mountain has been continuous -- 24 hours a day, seven days a week. Eighteen years after the "mountain top removal" project began, Larry Gibson now occupies the highest point of land around; he is enveloped more than 7,500 acres of destruction of what was previously a forested mountain range. The 50 acre tract Larry occupies atop Kayford Mountain is family land on which relatives and friends gather all year round for recreation. It also includes a family cemetery, dating back to the 1700's. 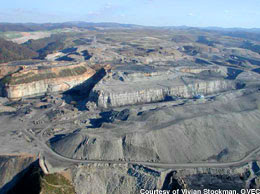 Unfortunately, it is also surrounded by one of the largest mountaintop removal coal mines in Appalachia. Directions - Kayford Mountain is located near Cabin Creek, approximately 35 miles south east of Charleston, West Virginia, and is accessible from Exit 79 on Interstates 64 & 77. Kayford Mountain is a 45 minute drive from Yeager Airport or the State Capitol in Charleston, West Virginia. 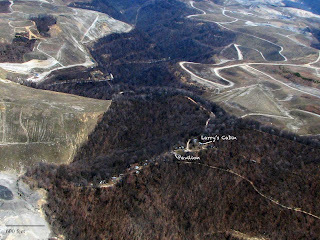 Larry Gibson regularly hosts public officials, students, journalists and other interested citizens who have not witnessed a mountain top removal project in person. No picture of any size can convey what it means to be encircled by this kind of project. Larry will be happy to give you, your class or other group a tour of the area. It is important that you follow these directions as written below and don't rely on directions from your GPS or Mapquest or any other source that takes you across Pax Mountain from I-64/77. From Charleston, WV Follow I-64/77 south (through the toll gate) and from Beckley Follow I-64/77 north. Take exit 79, then turn Right at the bottom of the ramp if you're coming from the north and a Left at the bottom of the ramp if you're coming from the south. Travel 1/10th of mile then turn left into the parking area. Look for the Pavilion and stage area down the hill. 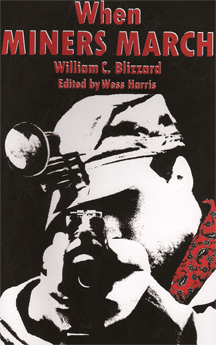 The West Virginia Coalfields are rich with history of peoples' movements and organizations fighting for justice in our communities. We know that Mountaintop Removal is an expression of corporate power and is connected with the rest of the crimes of the coal industry, both on & off the job site. We strongly encourage you to include a tour of our strong union history highlighting real people fighting for justice. This tour features the WV State History Museum (exposing the lack of real peoples history), Holly Grove, Kayford Mountain, and the Whipple Company Store. To set up a day long tour featuring our rich union history, visit the When Miners March website or directly contact Wess Harris at (304)927-5333 and flatridge@hughes.net.